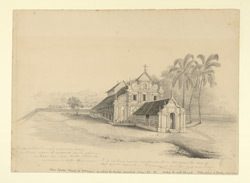 Pencil drawing of a Syrian church at Kottayam by Josiah Bateman (c.1802-1893) in 1835. Inscribed on the front is: 'I scrambled through a native house and stood upon a mound in the garden rather too close to the church in order to take this view. It is rather more confined than this gives the idea of but quite correct - I wandered here the first morning'. A further inscription on the front reads: 'Pure Syrian Church at Cattayam in which the Bishop preached Nov. 22. 35. Called the Little Church taken from a garden close at hand'. Kottayam, previously a part of the princely state of Travancore, is situated in the foothills of the Western Ghats, Kerala, southern India. The area has traditionally been an important base for the Syrian Orthodox community in India. Two important churches dedicated to St. Mary, the Valia Pallia and the Cheria Palli (‘small church’) are situated on a hill at Kottayam 50 metres apart. The Cheria Palli, featured in this drawing, was consecrated in 1579 and has some attractive murals of biblical scenes painted over the altar.